This story about printed catalogs originally appeared in Volume 7 of Domtar’s Blueline Magazine. It has been edited for the Newsroom. In the not-so-distant past, printed catalogs were the top choice for marketers to showcase their goods to captive audiences. But along came online shopping, bringing with it an all-new dimension to consumers’ purchasing paths, along with digital marketing tools to drive purchasing behavior. Yet even the most compelling digital marketing methods haven’t dampened the power of printed catalogs. In fact, instead of disappearing, printed catalogs have only gotten smarter, more targeted, more strategic and just flat-out cooler — making them true rock stars in the marketing mix. In 2015, the U.S. Postal Service Office of Inspector General worked with Temple University neuroscientists to conduct a study using fMRI brain scans to compare participants’ responses to digital and physical media. The study showed that paper advertising activates the ventral striatum — the part of the brain that assigns value and desirability to featured products — more than digital media. Increased activity in the ventral striatum can signal a greater intent to purchase. Our natural cognitive connection with print is great news for marketers. Many savvy brands have recognized the power of print’s multisensory experience and are using it to their advantage. According to a 2015 study by Mequoda, 69.6 percent of adult Americans had read an average of 2.91 print magazine issues in the 30 days prior to being surveyed. It seems that consumers still love a good printed piece to hold in their hands. Printed catalogs have become profoundly more creative. A mix of products, narratives, photos and other creative content provides consumers with unique and inspiring ways to connect with brands on a sensory level. IKEA, known for affordable home goods, uses their printed catalogs to showcase articles on how furniture isn’t just furniture; rather, it facilitates a way of life. Additionally, the catalogs often include interviews with IKEA furniture designers, allowing readers to better connect with the product and the company. With this type of newfound creative and editorial stance, marketers use these so-called magalogs — a blend of magazine-like editorial content and traditional catalog information — less as immediate sales tools and more as brand opportunities for their customers. Multichannel shopping is the new standard in the retail experience. Customers who engage with a brand through multiple channels are the most sought-after by savvy retailers. Printed catalogs encourage multichannel consumer behavior. Twenty-five percent of printed catalogs trigger a website visit, and 33 percent trigger a visit to a retail store, according to a Canada Post Study. Print creates natural connections with multiple points in the buying experience, leading consumers online to product review and brand websites, or to shop from an app on their phone. The use of augmented reality (AR) has also enhanced printed catalogs by allowing the once-static space to deliver a digital experience for consumers. IKEA pioneered the trend by offering an app for consumers to virtually try out furniture from the catalog. Today, many retailers are following their lead. Converse offers an app that allows consumers to virtually “try on” shoes, by pointing their phone at their foot. Northern Lighting, a Nordic company specializing in the design and manufacture of luxury in-home lights, invites consumers to see lighting on the table or floor by using the AR feature paired with their printed brochure. Gone are the days of generic mass mailing. Today, printed catalogs have become targeted and strategic. With the help of customer data, printed catalogs now can be customized to include items an online shopper may have viewed but not purchased. Mailings also can be sent specifically to buyers who have previously made online or in-store purchases. Customer data can also alert brands to potential sales opportunities, such as birthdays, anniversaries, graduations or new-home purchases. Nordstrom, for example, chooses to select a few key pieces to advertise in its printed catalogs. With the Nordstrom app, readers can shop the item online, get additional information on sizes and colors and even access styling details. Catalog mailings triggered by data collected from these actions can then be highly customized, allowing for more meaningful and personal connections with consumers at exactly the right time. There’s nothing quite like a beautiful printed piece to imply permanence and credibility. Neiman Marcus, a brand synonymous with luxury, reinforces its high-end status by making an aggressive statement with its annual holiday catalog, which features outrageous, over-the-top fantasy gift offerings like a Valkyrie private plane and a limited-edition Infiniti sedan. More and more, retailers are turning to the powerful brand engagement only print can offer by crafting printed catalogs that are meant to be perused, enjoyed and even displayed on the coffee table. Every marketer knows that each medium in a marketing mix has to contribute to the growth of the brand. Print is a proven performer, leading the way in many buyers’ journeys. Approximately 92 percent of consumers get ideas for household shopping trips from the printed flyers they receive in the mail, according to a Canada Post study. 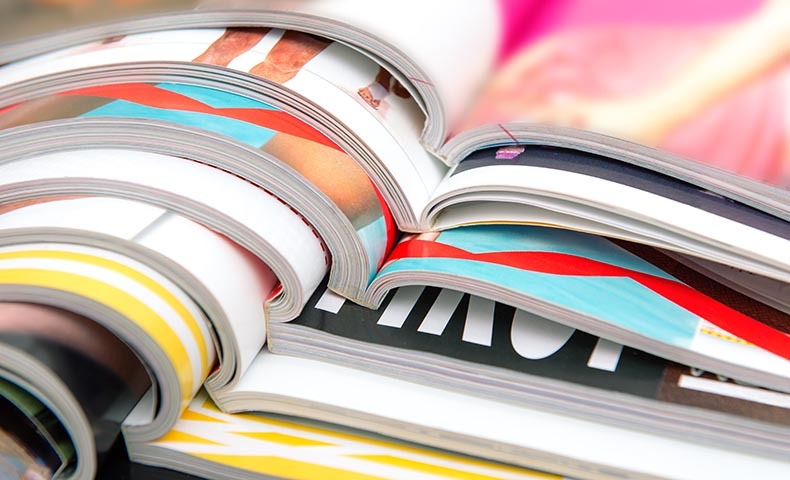 Printed catalogs engage the reader, create an experience and build brand loyalty — and they instigate purchases. For marketers who seek to tell a well-rounded brand story, it’s an exciting time to explore print. With its proof of cognitive engagement and sales funnel performance, print has found a powerful place in the consumer buying experience and continues to be a force to be reckoned with. To read more stories about Domtar paper, design trends and printing techniques, visit Domtar’s Blueline Blog and subscribe to the Blueline Magazine.